Although grandma may have handed down her favorite recipe for chicken dinner, a whole new generation of home chefs continue to get creative with ...THE white meat. It's juicy, tender and delicious, and yet so versatile that it may be difficult to decide upon your own favorite classic chicken recipe. Today it can be served just as often as Southern fried chicken, as a party snack a la Buffalo chicken wings, or popular barbecue favorite - or why not get really creative by learning to make your own Italian restaurant favorites such as Chicken Tandoori, Chicken Parmigiana or savory Chicken Marsala? Of course, chicken is just as tasty as a stir fry, in an easy casseroles, in summer salads, or when winter rolls around prepared in a steaming pot of homemade chicken soup, (a.k.a. "Jewish penicillin") as a natural immune system booster. Although one of the easiest meats to buy, store, and prepare, cooking the perfect chicken takes practice! Beginners usually make the mistake of slow cooking chicken to ensure that the meat is thoroughly heated through. But more expereienced cooks will tell you that the juiciest chicken is prepared flash-fire hot, at first. When frying chicken pieces, put your pan over high heat and let the chicken sizzle as the extra heat helps seal in the juices and turn the skin a golden brown. Then lower the heat as you let your chicken cook to mouth-watering perfection. Another secret to perfectly pan-fried chicken? After lowering the heat, cover the chicken and let steam for 10-15 minutes before uncovering in the final minutes to let crisp. The cover will not only cut down on cooking time, but your stove top will also remain relatively spatter-free! • Chicken is one of the most inexpensive buys at your local supermarket, but before you purchase be sure to check the freshness date and refrigerate promptly or freeze if not used within 2 days. • Always wash hands, countertops, cutting boards, knives and other utensils used in preparing raw chicken before they come in contact with other foods. Chicken Roost - U.S. Chicken Council guide with an extensive recipe database, cooking tips, nutrition information, tips on storing and freezing, instructional videos, free newsletter. 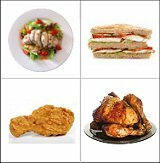 Cooks.com - Chicken Recipes - Pages of recipes with complete instructions for barbecued, baked and fried chicken, Italian, Chinese, Hungarian and other ethnic dishes, chicken salads, casseroles and sandwiches. The Ultimate Roast Chicken - The Food Channel's favorite chicken dinner recipe garnished with bacon strips, fresh orange, thyme and parsley. Yum. Better Than Best Fried Chicken - Five-star rated recipe from AllRecipes.com with complete ingredients & instructions for crunchy fried chicken including visitor comments and reviews. Top 20 Quick & Easy Chicken Casserole Recipes - Check out popular chicken recipes with instructions for scalloped chicken, chicken Florentine, chicken & macaroni bake, and lots more. Chicken Soup Recipes - More than 100 recipes submitted and rated by visitors including clear, creamy, chicken noodle, rice, gumbos and chowders.